Even though the current version of the Audi A4 first hit dealerships all the way back in fall 2008, periodic updates make the 2013 A4 a lot more competitive than its vintage would suggest. It's a textbook example of how an automaker can keep an older model fresh. 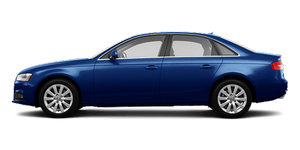 BMW's redesigned 3 Series will hold on to the perennial sport-sedan spotlight, but the 2013 Audi A4 is an unfairly overlooked competitor. Chief among the updates for 2013 are revisions to the car's face, including redesigned headlights, and some functional changes inside (compare the 2013 and 2012 A4 here). The A4 now comes only as a sedan with a turbocharged four-cylinder engine; the related S4 has a supercharged V-6. Audi replaced the A4 Avant wagon by resurrecting the Allroad nameplate — essentially an A4 Avant with better off-road chops. Read my review of the Allroad here, or compare the A4 and S4 here. This review focuses on the A4, which comes with front- or all-wheel drive and a manual or automatic transmission. Compare them here.